Established in 2001 by winemaker Dan Sullivan, Rosehall Run was one of the earliest Prince Edward County wineries planted in the west central region known as Hillier. The 150-acre site was selected due to its proximity to Lake Ontario and the remarkable clay soil scattered with rock and shale fragments on a calcareous limestone base. Today there are 25 acres of thriving vinifera including Chardonnay, Pinot Noir, Pinot Gris, Sauvignon Blanc, Gewurztraminer, Muscat and Tempranillo. Dan and his team manage the vineyards proactively, practicing sustainable farming through the use of integrated pest management and early identification and prevention of potential pests and diseases. These gentle, environmentally-sound grape farming techniques extract the optimum fruit from our unique Prince Edward County terroir year after year. A focus on state-of-the-art winemaking led to the design and construction of a 7,200 sq ft winery facility and gravity-fed barrel cellar blasted deep into the limestone foundation. Each barrel is selected by Dan to ensure wines are not overpowered by the oak that plays a supporting role in his portfolio. Prior to bottling each barrel is selected individually and blended through a series of trials resulting in the final blend. Minimal handling ensures that the wine has retained the natural texture and flavor that emerged from the barrel. Visitors to Prince Edward County can enjoy Rosehall Run’s critically acclaimed wines in a modern Tasting Barn surrounded by glass allowing for an abundance of beautiful natural light and stunning views of the vineyard. 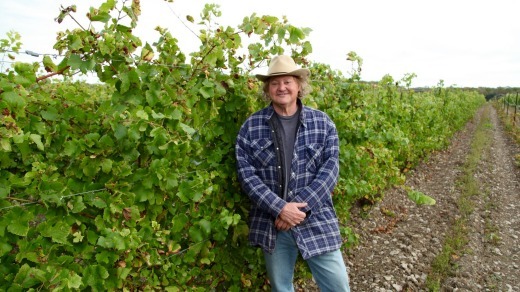 With over 30 years’ experience, Dan Sullivan is now recognized as one of the top winemakers in Ontario. After 15 years honing his craft as an award-winning member of the Amateur Winemakers of Ontario, in 2000, Dan embarked on his dream of growing and making estate wines in Prince Edward County. Dan practices a hands-on approach to winemaking that begins in the vineyard. The wines he produces are balanced and elegant, a reflection of both terroir and vintage. Since his 2005 Pinot Noir debut which wine writer David Lawrason identified as one of Six Wines that Define Canada’s Future, estate grown Pinot Noirs and Chardonnays have garnered consistent local and international attention. As an industry leader, Dan works with chefs, restaurateurs and fellow winemakers to raise the profile of Ontario's thriving local food and wine community. Dan is a founding member of i4C, a member of the Wine Council of Ontario Board of Directors, a member of the VQA Board of Directors and serves on the Advisory Committee for the Algonquin College Sommelier Certificate Program in Ottawa. From our origin 17 years ago in Prince Edward County, Chardonnay has been the heart and soul of Rosehall Run Vineyards and the viniferous muse of winemaker Dan Sullivan for even longer. Dan has been making Ontario Chardonnay since his first crush 23 years ago. Located in the most northerly DVA in Ontario, growing exceptional quality vinifera fruit can sometimes be daunting. Winter temperatures approaching -30 C can occur, necessitating vines and renewal canes be buried to overwinter under the soil. Mother Nature’s influence on the vines instills discipline on the grape growers of Prince Edward County. This influence extends into each bottle where the rocky calcareous limestone and lake moderated climate of our vineyard are evident. Rosehall Run has been producing racy, mineral-tinged Chardonnays since our first crush in 2004. For Dan, expressing the character and structure of the fruit is the highest homage that can be paid to the earth from which it originates. Dan was an early champion of handling barrel fermentation and elevage exclusively in 500 L oak puncheons. By using this larger format cooperage and limiting batonnage, the fruit, acidity and nuance of our rocky soils are treated with the utmost respect. The results speak for themselves as our wines continue to be an iconic expression of what it means to be 'County' in the world of wine. Today Rosehall Run offers three 100 % estate grown iterations of Chardonnay: Our traditional method Blanc de Blancs sparkler CEREMONY, our unoaked Hungry Point Chardonnay and finally our iconic barrel-fermented JCR Rosehall Vineyard Chardonnay, named for our co-founder John Campbell Reston. Each wine expresses the place first and displays the beautiful diversity of style that can be achieved with Chardonnay. We also produce the carefully crafted, exemplary value ‘Liberated’ Chardonnay available at the LCBO.